Happy Thanksgiving! 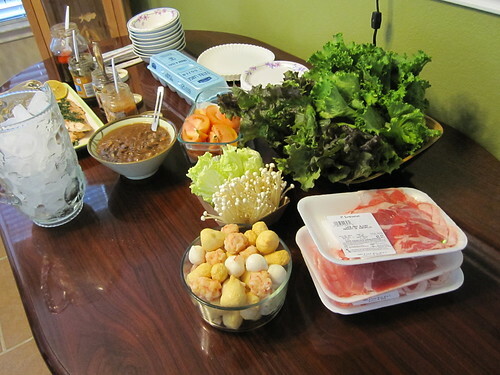 I celebrated in Asian style this year with a traditional Hot Pot. Basically a hot cauldron of boiling broth is at the center of the feast and an array of raw ingredients surround the hotpot. You select what you want and cook it like in a fondue and cool it off with your personal blend of sauce. I'm actually having a Thanksgiving potluck on sunday so that's where I'll be busting out the turkey. Hope you had a great Thanksgiving! For those of you that are black Friday-ing right now best of luck to you. Three Day Shortribs. I know it's a repeat of a former bento but I didn't name that one three day shortrib err. oh wait.. well nevermind, better come up with a new title. Anyhow, it's been a while and I don't believe my current crop of bento-ers have had the chance the taste possibly the most wonderful thing that can come out of my sous vide machine. 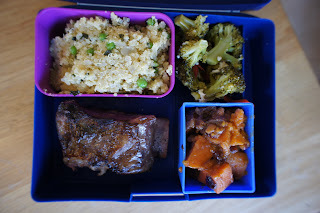 Outside of the fact that I wanted to do my short ribs again, the inspiration for the bento is the nice cool weather we've been having, it makes you wanna have something that hearty and "sticks to your ribs" if you'll allow for the pun. 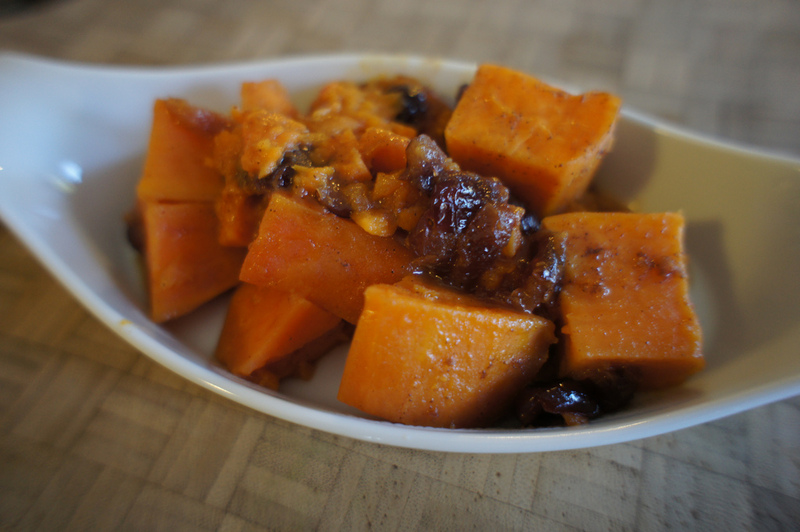 Besides, Thanksgiving is around the corner and I wanted to test out this sweet potato dish. So um. Fall Short Rib bento it is! I promise to work on more cohesive themes. Three day short rib, what's there really to say? It's meat, lots and lots of meat slowly cooking for three solid days in a water bath. Why three? It's some sort of magic number. See one day just isn't enough. Two days is tasty. Three is like eating a little piece of heaven. Actually, just because I'm that obsessive about "knowing for sure" I ran a test of three batches starting each one day after the other until I had a sample of three to taste side by side. Two days is nice, but three days is a must if you have the time. What's that short rib doing in those three days? Well to answer that question you need to know a little bit more about the beef short rib. That particular cut of meat contains a lot of fat and connective tissue. These types of meats tend to be considered the "cheap cuts" (well once up on a time), stuff like flank steak, shanks, and short ribs. Why cheap? The various cuts have lots of connective tissue which, if not treated properly, produces a very tough and chewy end dish. So what's a cook to do? Well you have two options, cut the meat thin and cook it on high heat fast or keep it in large hunks and cook it low and slow. 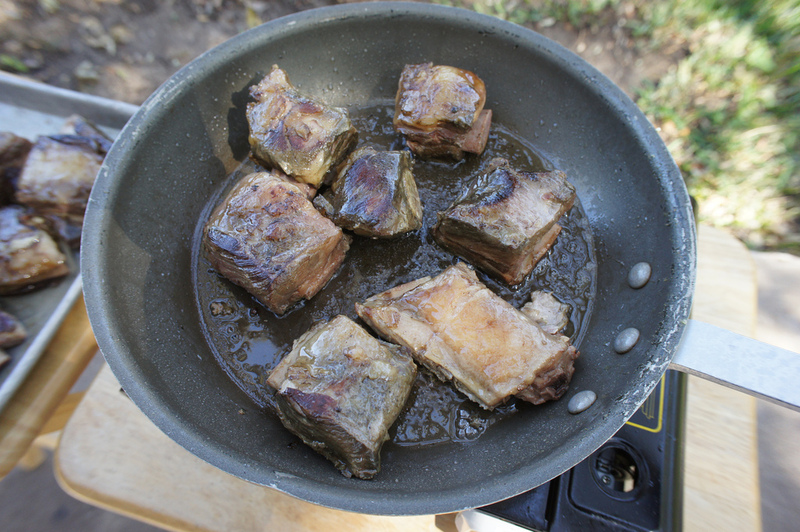 Let's take the short rib, you can get the "flanken cut" which if you think of a row of connected ribs is a slice off the top then you cook that fast as you would with Gal-Bi (Korean short rib barbeque). Still kinda chewy but, it's such a small cut that it's a tiny bite size not like trying to chew down a brick of meat. On the other hand, as in the case I did today with the "English cut" single rib, you can cook it really slow. What this does is apply a gentle heat that slowly lets the connective tissue break down and turn into a more gelatin state and let the liquids of the fat and the "meat gelatin" (ok I could come up with a tastier word) to really moisten up the cut of meat. I finished this off by searing the outside so you get the nice brown outside caramelized effect. This usually produces a lot of smoke and oil hence doing it outside on my butane portable stove. I wanted a nice carb-y side dish without it being a empty carb like potatoes. I settled on this Creamy Truffle Quinoa. If you've read my blog you must know about my obsession with Quinoa. 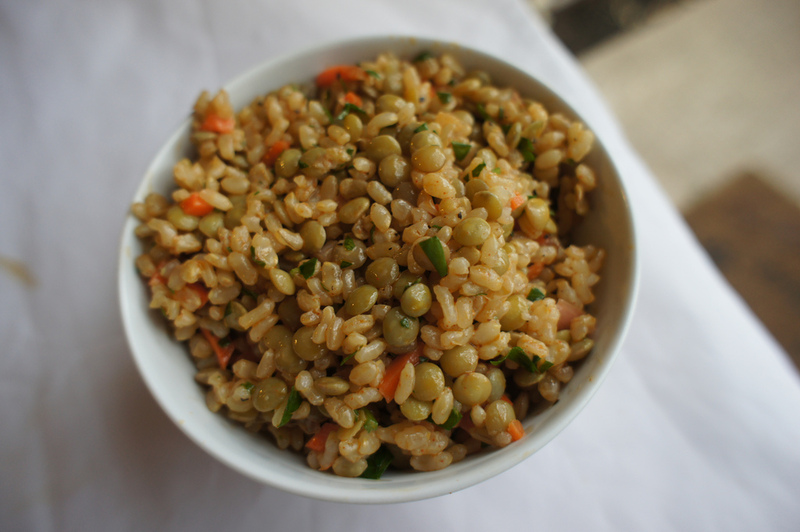 It's a great nutritious grain and an easy substitute for rice. The original recipe called for mint, but I decided to go with fresh basil because it felt a little more "right", besides the two plants are from the same family so it's not that far of a stretch. I cut down on the amount of butter and Parmesan, had to do my part to lighten things up a bit after the big short rib. I got multiple kudos on this dish everyone really enjoyed it. As usual I used a stock (in this case vegetable) to cook with the quinoa, it infuses the quinoa with a lot more flavor and you can effectively skip any need for salt. 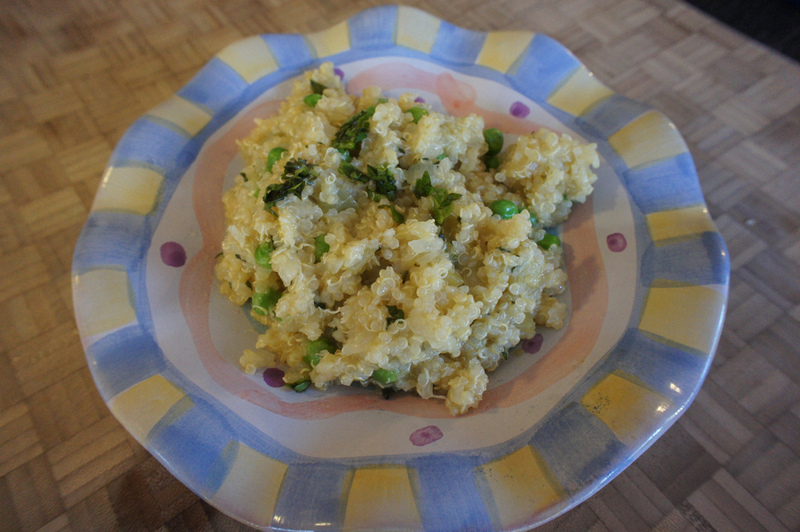 A lot of places that I've had quinoa seem to cook it like rice and simply use water, I find the resulting dish to be very bland and tasteless. Since I already had my SousVide Supreme out for the short ribs, I put together a few packets of broccoli and roasted bell pepper while the beef was resting. I put in a bit of butter, the left over parmesan, and garlic. I love the flavor of the dish, since you don't lose flavors to a pan or cooking liquid the taste is very "bright" or jumps out at you. The only downside to this preparation is that the broccoli turned a bit yellow on me. I was quite surprised because I didn't experience this same problem with either the peas or beans I've done in the past with the SVS. I'll have to do a bit more research to understand where it went wrong. I'm not sure if I'll have any more bentos for the year (maybe one) Thanksgiving is right around the corner shortly after I'm off to Taiwan to visit family then we run right into Christmas. I'm sure they'll be some food adventures in Taiwan, so I'll probably post some stuff from there. So just in case I don't get to post, Happy Thanksgiving and Happy Holidays! I couldn't really think of a good coherent theme this week. It's been so busy and although I've been busily clipping new ideas and storing them away it can get overwhelming when you stare at the "future bento" tag list for my note file. As it turns out I had quite a few recipes from the magazine EatingWell so I assembled my top favorite looking recipes and off I went. I really enjoy the magazine, it's one of those that I pick up from the local bookstore when I happen to see it. There's always some interesting articles but the important part is they manage to put together some very tasty looking (while at the same time healthy and nutritious) foods. I might some day get around to a subscription, I just have so many magazines I have to "process" every month as it is.... oops I'm yammering. Anyhow healthy bento it was and I managed to score bonus points because I was able to make it a fully Gluten Free bento. 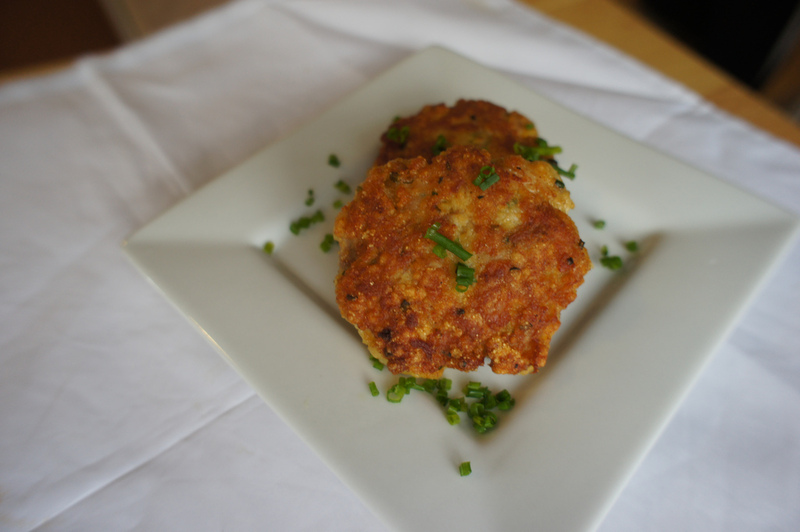 This was suppose to be Spicy Chicken Cakes with a horseradish aioli, but I did a few tweaks here. I opted to grind together chicken breast and thigh meat instead of just breast meat, I also cut the mayo and went with the Olive Oil based mayo which is half calorie and fat (that was part of the binder). And since I wanted to go gluten free, I subbed out the breadcrumbs with "corn flake crumbs". I went with the corn flakes because when it fried up it gave a nice crispy texture to the outside of the cake (and thus retain some moisture). Because I went with a bit more fat in the meat I didn't think I really wanted to add in further calories and fat in the form of the aioli sauce, it tasted just fine without it (that and I was getting a bit lazy). Anyhow these turned out great. Since it was hard to buy one pound of chicken I ended up with like 60 of these chicken cakes (about six pounds of meat), we'll see how well they hold up in the freezer. For a starch component I went with this Rice and lentil Salad. I love the texture of the salad. The rice and lentils were tossed in with a bit of red wine viniagrette. 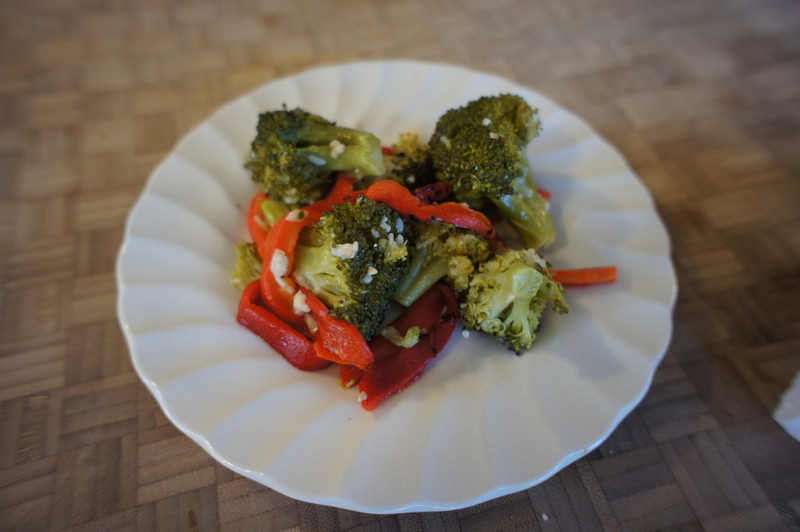 The dressing was not very overwhelming, definitely added a slight twang to the dish. The original recipe asked for canned lentils which is a nice time saver but at $3 a can (for a total of $9) I decided to go with the single bag of dried lentils at $.67 and boil/simmering for 30 mins. That money could easily go to something else and I could afford the stove space. 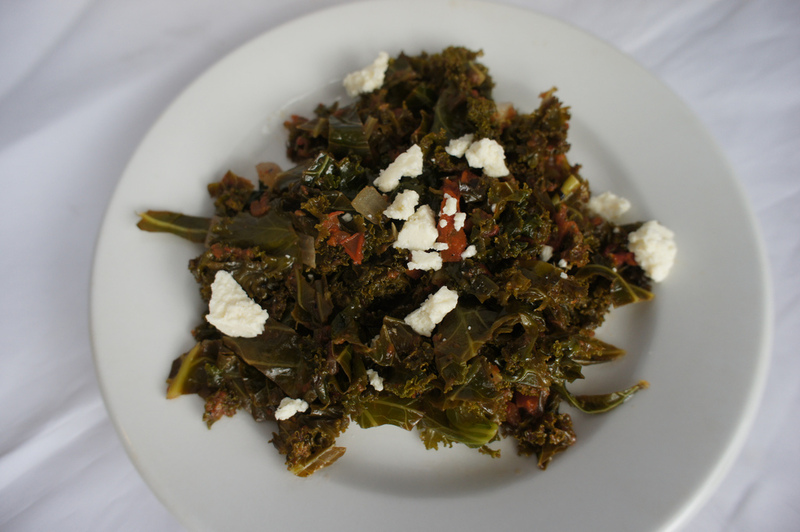 There is a recent interest in Kale, you see it in all the cooking magazines and blog posts. Most of it in the form of smoothies, green smoothies have recently start popping up at work (we have a health challenge going on). Anyways, there's pretty good reason for all the attention, it's packed full of good for you vitamins and minerals. It's also high in fiber so it's really a big favorite with all the different diets floating around these days. Given all that I knew this Salsa Braised Kale was definite in, I figured this was a good chance to work with Kale and the recipe happened to be really really really simple. All you do is heat a bit of oil quickly saute the kale, add in some salsa and water and let it braise for 15 mins. Optionally toss in a bit of cheese but I though it was fine without it. I had some initial misgivings as the kale was very tough but the braise really softened it up quite a bit and it's a really tasty dish. I went with the "fresh" roasted tomato salsa in the fridge section and a carton of the fresh pico de gallo both had enough seasoning such that I didn't even need to add any salt. 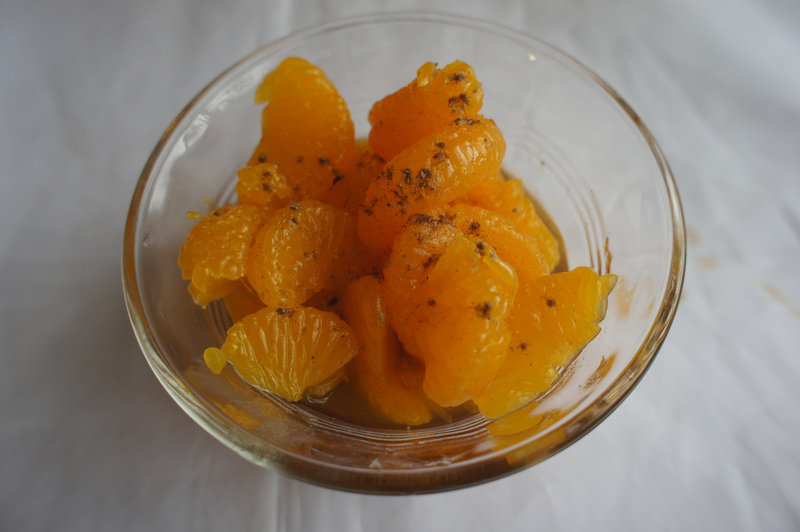 Finally dessert, I wanted something dead simple and I found it with this Tea Scented Mandarins. I cheated and went with canned mandarins and rinsed off the syrup. From there you just boil up some black tea and add some honey and ground cardamom. 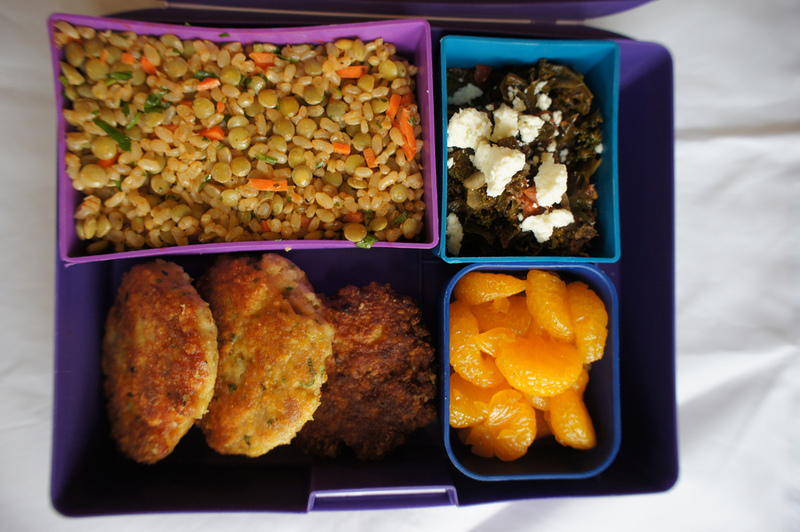 The flavors really developed over night and was a surprise hit with the bento-ers. A few of them were like, huh canned oranges (the tea syrup is not immediately obvious) but the unusual flavor turned quite a few heads. I got another bento coming up next week but then holiday season will be upon us. Stay tuned! Hey guys, sorry about the lack of bentos lately. Work has really ratcheted up and free time has gone down to a minimum. I've had a few photos and off topic posts that I wanted to put out but simply getting a moment to write a quick post has been difficult. I'm actually doing this one over my lunch just to take a break from my deluge of emails and meetings. Anyhow, enough belly aching. I had the great fortune to cook with a long time friend and coworker. She and her husband use to have a Persian restaurant in town and both are fabulous cooks! She invited me to help host/cook for a party of our friends just to get everyone together. We've done this in the past and it was a wonderful opportunity to learn a bit more about Persian cuisine. So given the chance I immediately jumped on it. Besides, her house is beautiful and her kitchen a joy to work in just look at the view (from the title shot) and this outdoor/kitchen grill. The indoor kitchen was just amazing it really has everything I could ever want in a kitchen. I got to watch the sun set two nights in a row as we cooked, simply amazing. I need a kitchen like that! Anyhow below are all the dishes we made, I assisted and took notes on most of the dishes and contributed two of my own. Starting salads. Bean and olive salad and Tabbouleh. Spinach with dried cranberries and prunes. Bademjan with lentil - Eggplant with saffron sauteed onions and yellow lentils. This was a nice stewed eggplant dish great just as a side dish or as a dip with some pita. My two contributions: East meets middle east roll, Moroccan spiced chicken breast with saffron rice rolled as a sushi roll and served with a dynamite sauce (from my night cooking for the Flying Carpet as guest chef) and a spiced Pork tenderloin prepared sous vide. I was able to produce four of these all in one go in my little Sous Vide Supreme. I think I need to put up ads or get some sort of commission from these guys, I sure i've personally sold a few units just by cooking for people. Next up were the dolmas. In the Mediterranean/Middle Eastern cuisines there are many variations on stuffed/rolled grape leaves. Some use dried fruits and make it sweet, some savory, vegetarian, beef, lamb, in this case used beef and added lentils. Then there's the preparation/sauce used to cook the dolmas which span tomato based, simple broth or in this case a mixture of lemon and garlic topped off with water. Like tamales, dumplings, raviolis and piergo, dolmas are one of those cultural foods that you grab the bowl and ingredients stand around the counter with friends and roll out a few hundred. I like how ever culture has at least one of those communal cooking foods. It's a great way to get folks to participate and catchup on how everyone's been doing. I had a wonderful time hanging out with friends and sharing food. It was a lot of fun and I can't wait to do it again! 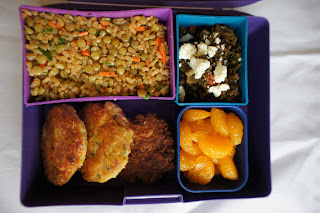 I hope to do a bento this week I might get one or two in before the holiday season takes up all my time. Thanks for dropping by!